In Norway for summer holidays. Time for a family trip to the cabin. 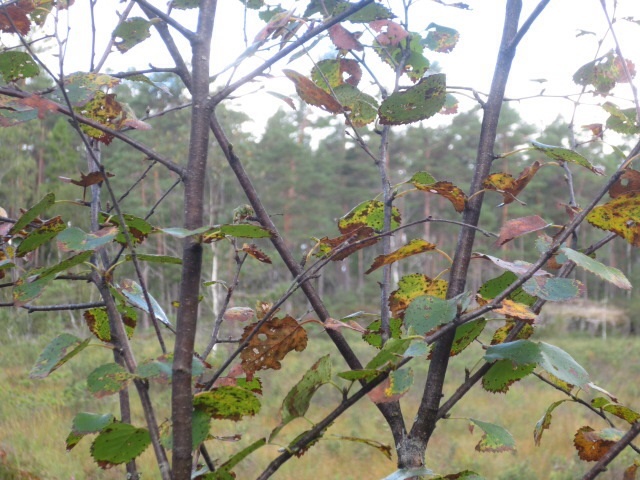 It is almost September, and the birch tree leaves are beginning to fade. 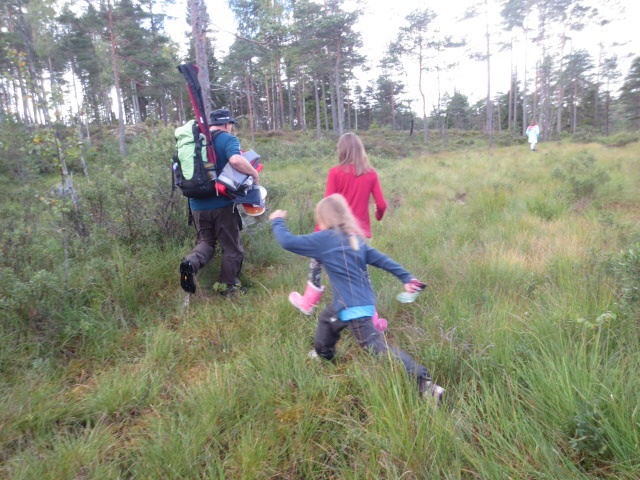 After all the rain here, the bog was quite wet, but the nieces jumped their way through. We have buckets for berries, thermoses with coffee, packed lunches and are harbouring hope that the rain will hold off for a couple hours. 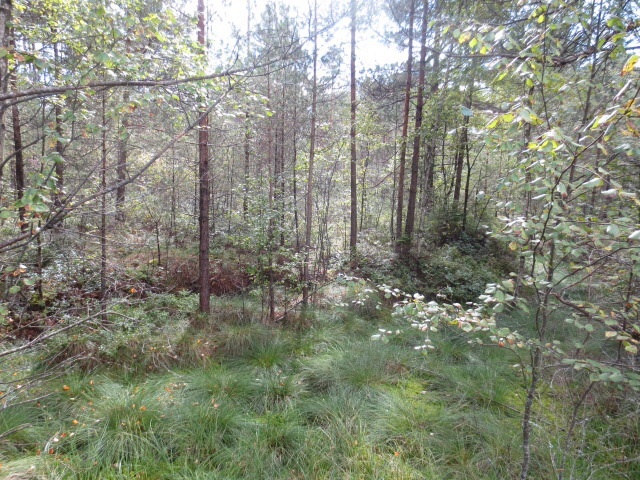 This is a large forest that stretches over to Sweden, with lots of elg (moose) and the odd passing wolf, we hear. Just bring nieces, they are lively enough to petrify any wildlife nearby. Finally, the cabin appearing between the trees. It is an old fashioned cabin, with no running water (except in the stream down the hill) and an outhouse. They have installed a solar panel now, to run the coffee maker, but the old mattresses are a bit mice-ridden, so we just came for the day. 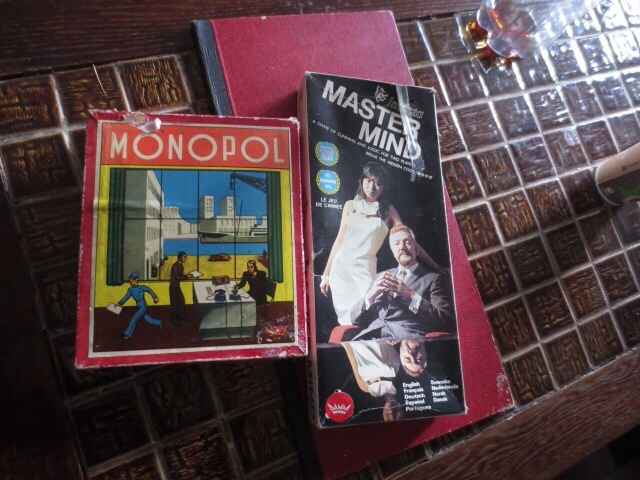 Nothing says cabin life like old board games! 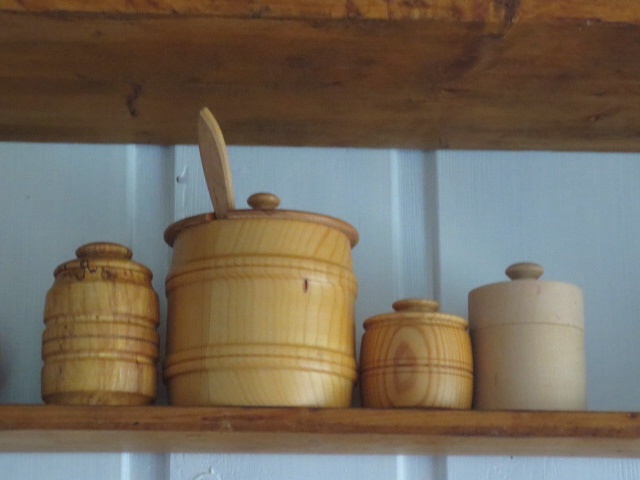 Or old wooden containers (mouse proof). 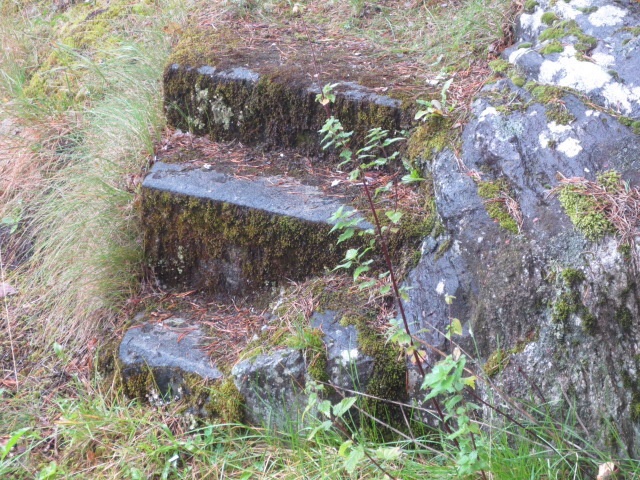 But we were here to pick tyttebær, lingonberries, which carpeted stretches of the forest floor. 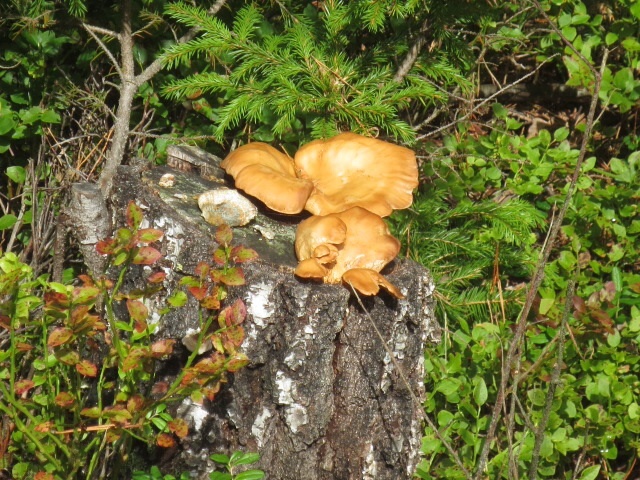 Very low-growing, and abundant this year. Easy to see with the bright red berries against all the green. These are mainly used as a tart jam with savoury dishes, but are also delicious in spice cakes or bread. 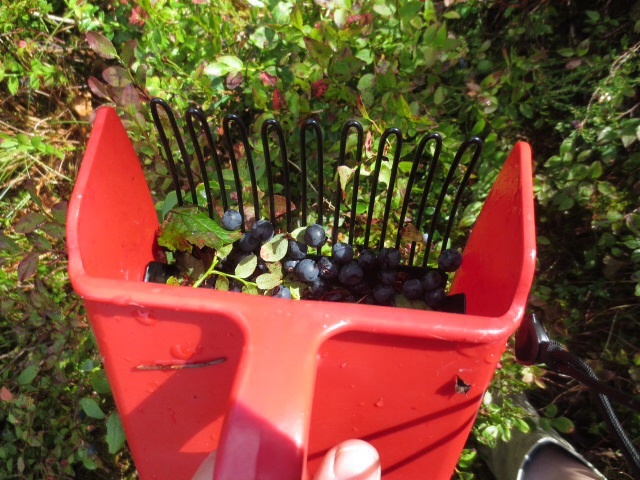 Same berry pickers were used as for blueberries, though as you can see the plants are somewhat different. Lots of bending over to pick, you really feel it the next day (at least we soft city-living people did……) It is very satisfying though, to be out in the woods picking berries in the quiet spaces between trees and streams. The rain came, so we retreated inside and to the veranda to enjoy our packed lunches and thermos flasks of coffee. Very nice! Here, a view of the outhouse. What was picked, between the those of us who picked. (The others were busy dragging a water-logged boat out of the lake.) It is a good year for tyttebær this year, so this is not a bad haul for a few hours out. Maybe a little early, but for fresh jam (berries just crushed, with a little sugar stirred in) these will be just fine. This entry was posted in travel and tagged Norway, summer, tyttebær on August 28, 2014 by krumkaker. 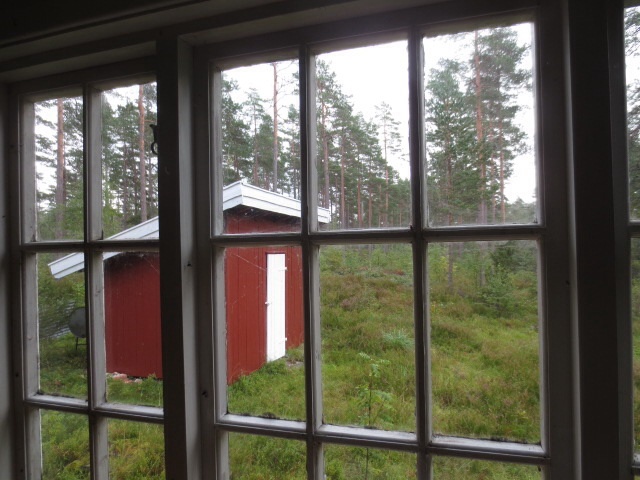 I am home in Eastern Norway for summer holidays. Wonderful, after the muggy Roman August heat, to be here with endless stretches of cool green nature and silence. I do love Italy, but I really miss Norwegian nature and all the space. 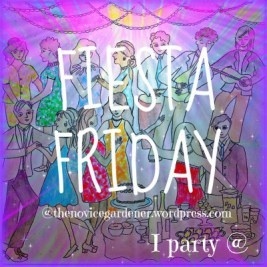 It goes on and on and on, and it is so quiet here! Of course, it was 6C this morning, and a high of 12C, so it is a bit chilly. Perfect for being outdoors though, so we walked up the hill to the woods. Here, we went for a walk in the “lysløype“, a path through the woods that is illuminated in the winter for skiing, so people can ski after work. 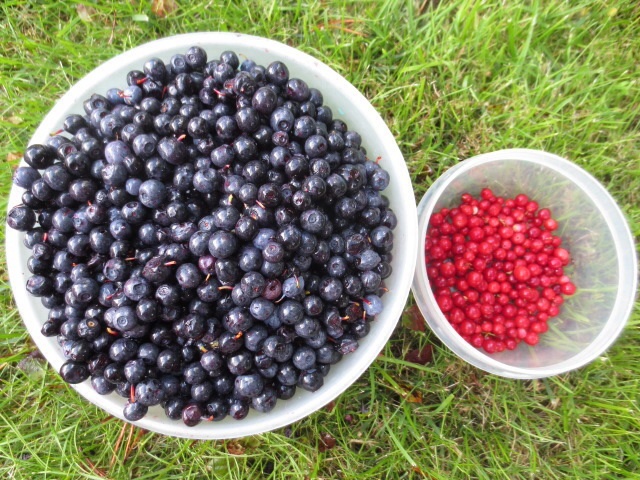 In the summer, it is very nice for walking and a spot of berry picking. 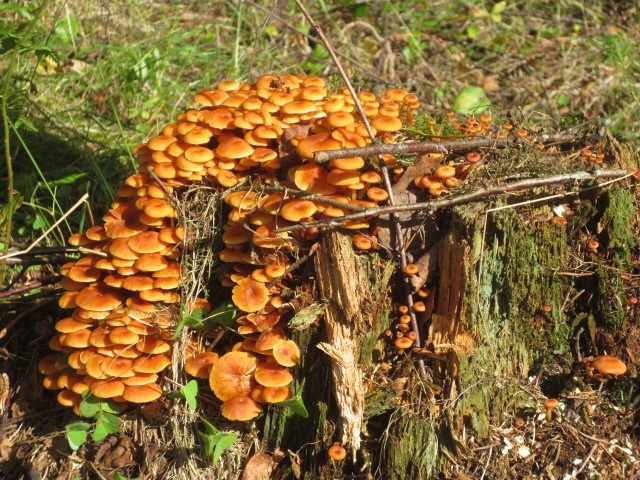 Also, for collecting mushrooms, IF we had the vaguest idea which ones were edible…..
….. Which we do not, so we left the mushrooms where they were. 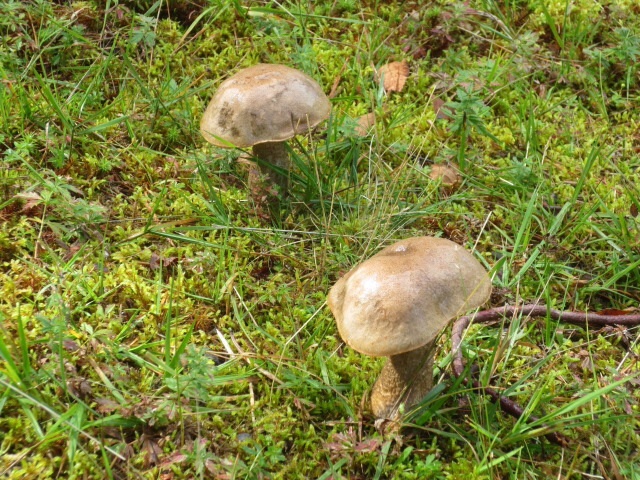 It has been quite rainy, so there are mushrooms springing up all over. Down to business: with more family in to visit, we needed blueberries for dessert. You might remember this contraption from my blueberry picking last year? It is a berry picker, very handy. 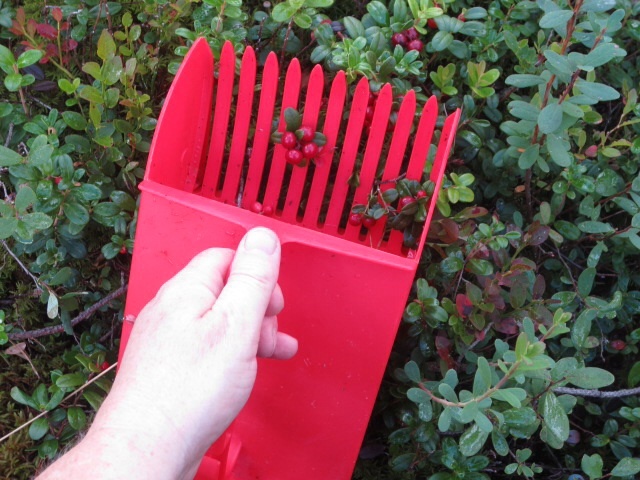 Older models were made in wood or metal, but this is my mothers’s modern plastic one for picking wild berries. These are wild blueberries, Vaccinium myrtillus which are technically bilberries in English, but blueberries to us. Quite low growing shrubs. 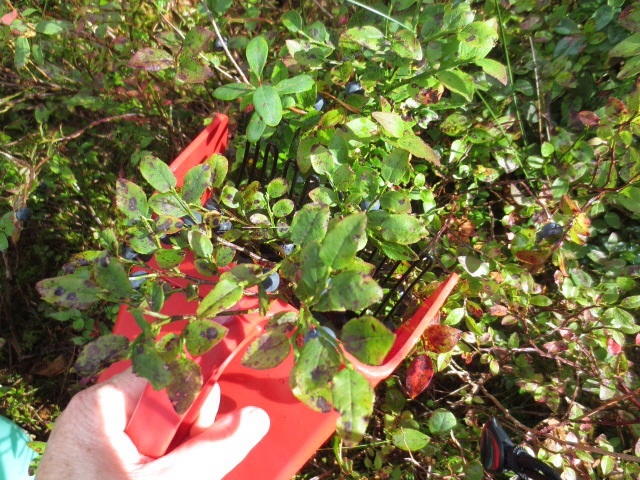 Using the blueberry picker, you comb through from below the plant toward you. More mushrooms, which I have no idea what are, but they do have lovely colours! 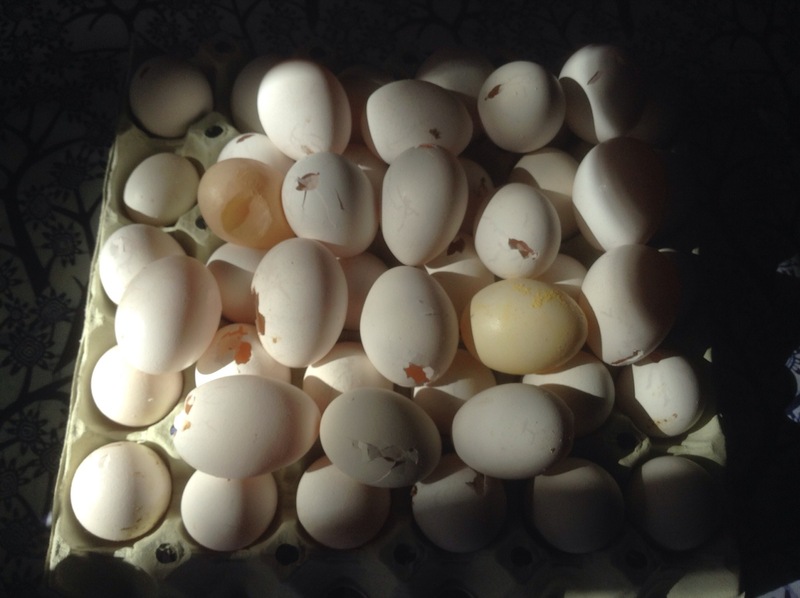 Not bad, for a brief spell of picking, between my mother and me. 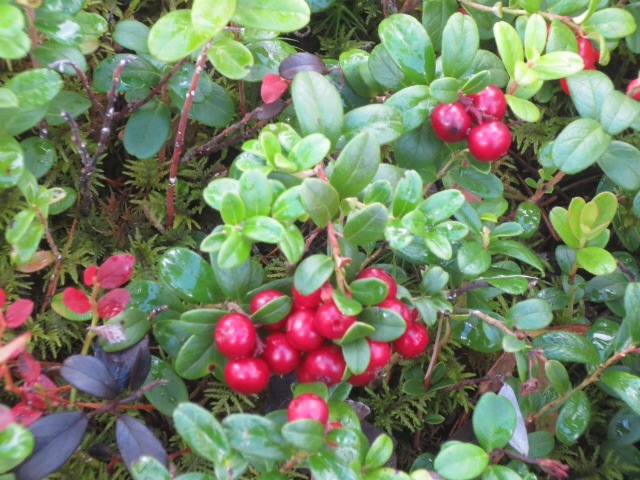 The red ones are tyttebær (lingonberries, Vaccinium vitis-idaea), which we also found. 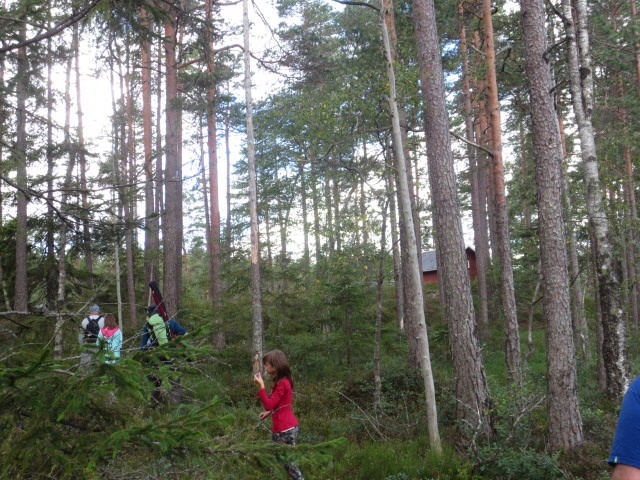 Apparently there are lots near the family cabin, so there will be a daytrip there soon for some serious picking. 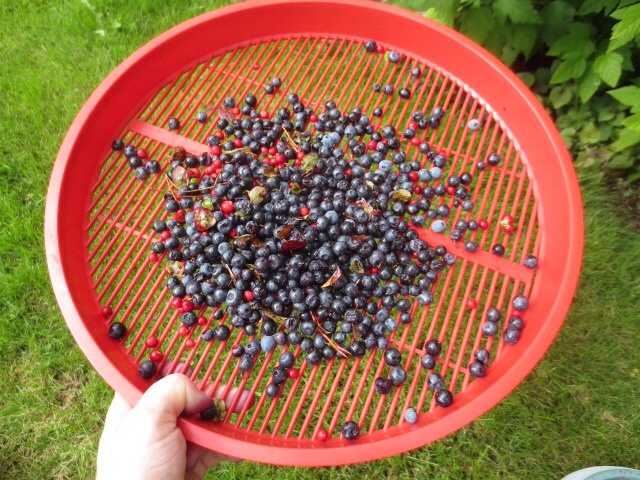 So, you have your small bucket of blåbær og tyttebær (blueberries and lingonberries), and now it is time to sort and clean them, which you do with a tray like this. Shake it, and small leaves and twigs fall through. 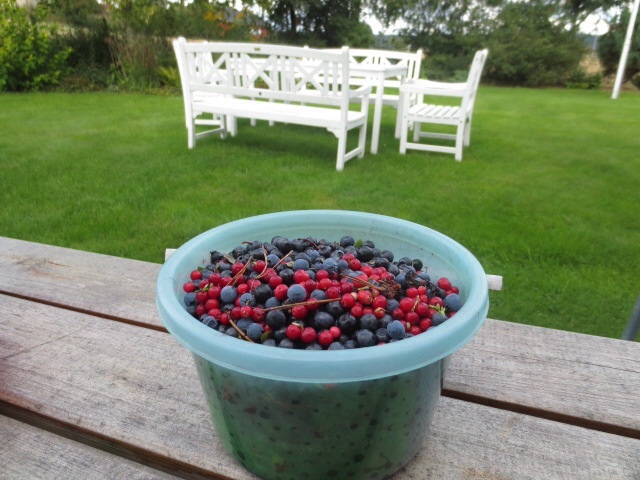 Pick out the lingonberries, and voila! You have berries ready for jam or dessert, like this. 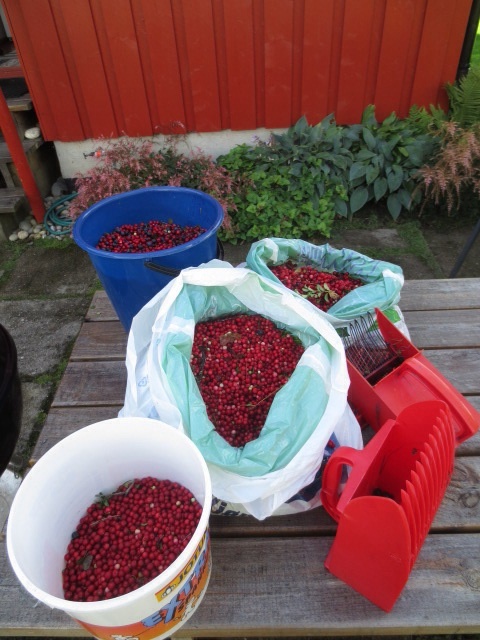 The lingonberries are very tart, but are great as a freshly made jam served with meat at dinner. They are quite robust, so I will pick some more to take back to Rome. IKEA there has lingonberry jam, but that is quite sweet and this is so much better. And the blueberries? 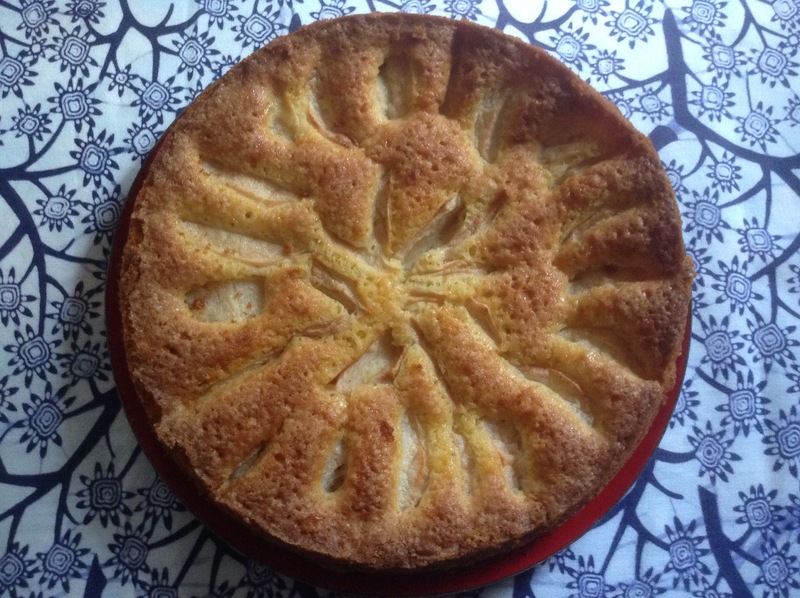 Some were frozen, but most ended up as dessert, with shop-bought vanijesaus. It is a vanilla custard sauce, served cold, and this is a delicious summer dessert. 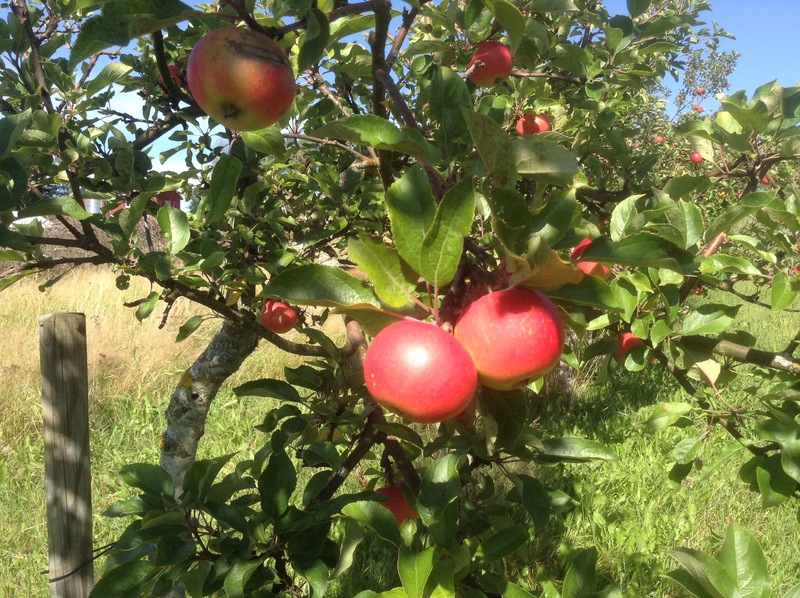 It is really nice to be home in Norway for some days: family, friends, Norwegian newspapers on paper and not just online, lots of good wholewheat bread and decent boiled potatoes, cool crisp weather and fresh plums just ripening on the tree. Not to mention the endless cups of filter coffee, and offers of cakes or waffles. That is the mainstay of my English husband’s spoken Norwegian, which I call his survival Norwegian. That much he has learned is essential, as we get through a lot of coffee visits while on holidays here. Relatives will smile and offer “Mer kaffe? Mer kake?” (More coffee? More cake?) several times, as that is polite. 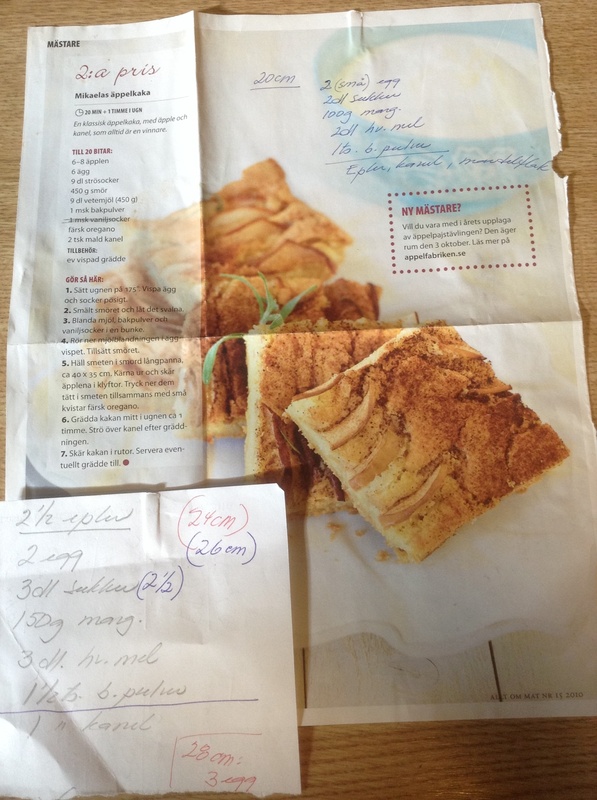 After a couple cups and a big slab of fresh apple cake, he will smile back and say “Nei takk” (No thank-you)…… unless perhaps they are serving fresh blueberries with vanilla sauce. That is such a taste of summer! 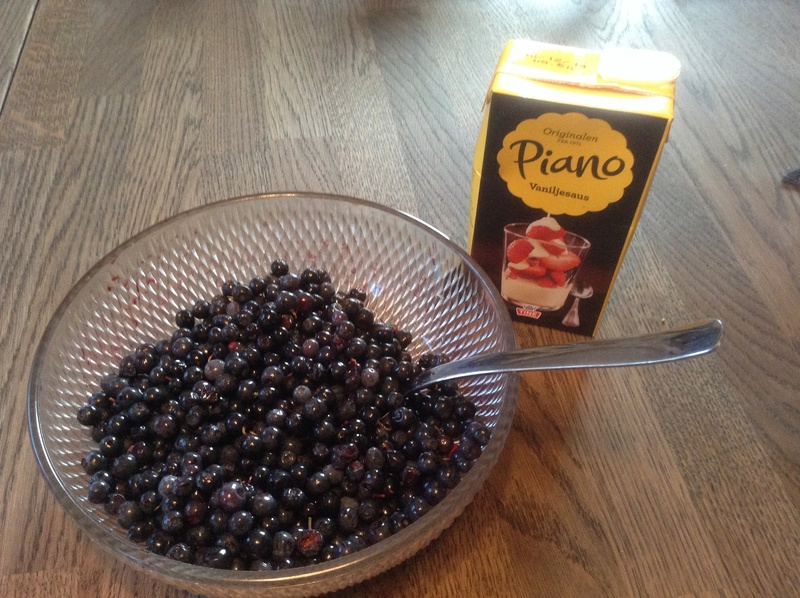 This entry was posted in food, travel and tagged blueberries, dessert, Norway, summer, tyttebær on August 26, 2014 by krumkaker.